After eating a bag of sugary sweet octopus balls, made with actual octopus extract, you might not want to have a conversation too close to me. When I'm at home I have plenty of opportunities to clean and re-fresh my breath, but when I'm at work, and I'm eating leftover wacky food-blog-stuff at my desk, I don't have the opportunity to brush my teeth before dealing with my clients face-to-face. 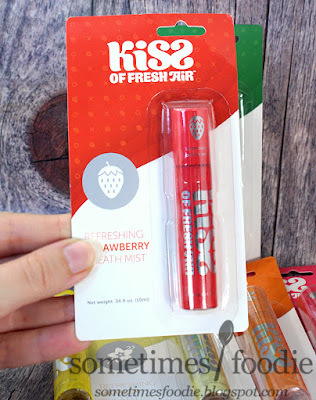 A while ago the people behind KISS of Fresh Air breath freshening spray sent me a message asking if I'd like to try their products, and I said, "Sure!" To be completely transparent, the company sent me this stuff for free, but this is not sponsored. 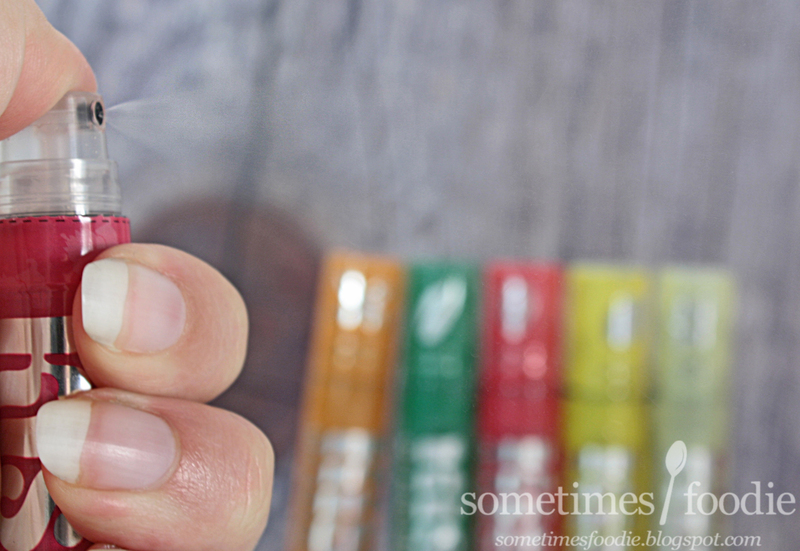 I'm just a food blogger with octopus-breath trying some free breath-sprays and letting you know what I think of the flavors. 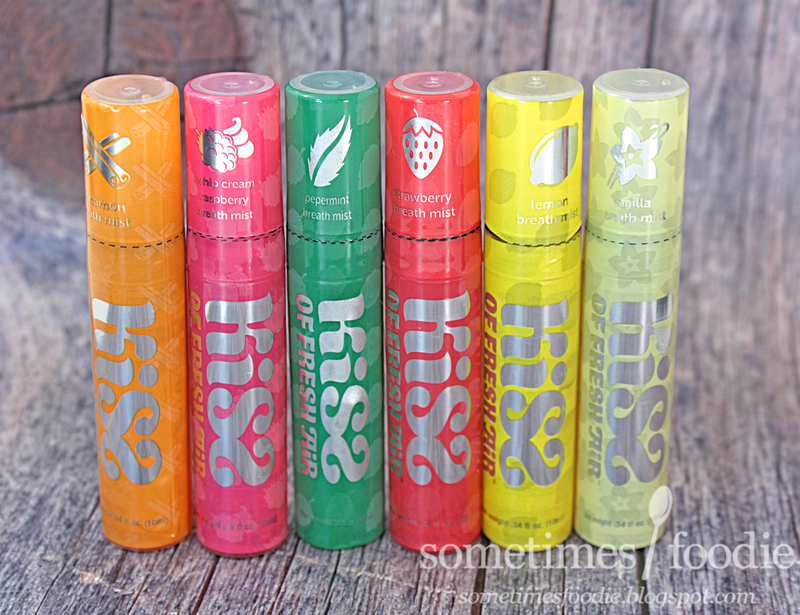 KISS' line-up includes a classic mint, but that's a breath freshening standard. We all know how that one's going to taste, so I rather talk about their wacky dessert-flavored sprays, like Raspberry Whipped Cream! The breath sprays came packaged in these little cardboard and plastic packs, which instantly reminded me of all the lipglosses I bought in middle and high school. 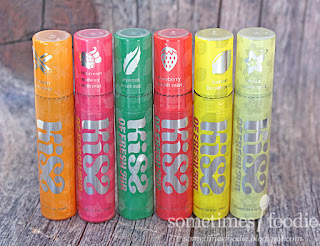 (These totally look like Lipsmackers, right?) The packaging is recyclable, which is always a plus, and it ensures that the product is 100% un-tampered with and sanitary. 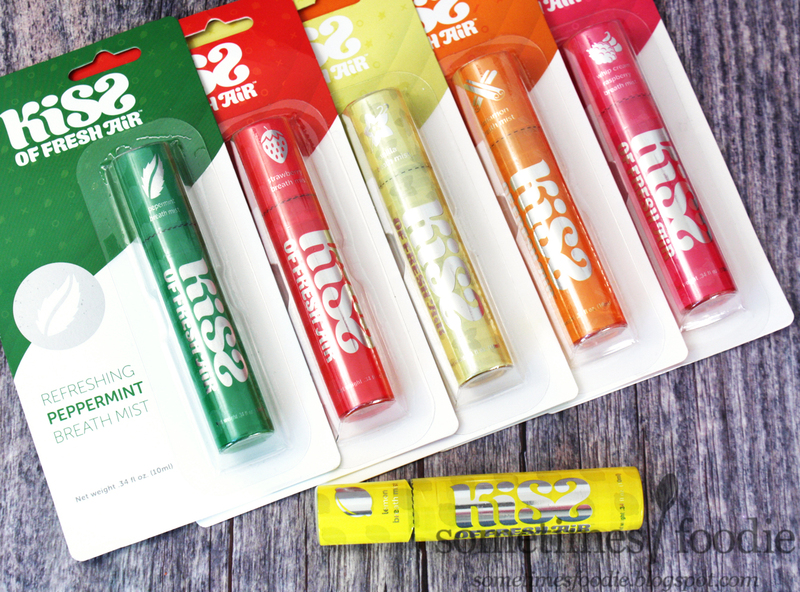 I like the simple, and bold color scheme for the brand, but the packaging does make me think of lipgloss more than a breath freshener. I think if there was some kind of imagery that evoked a mist or a spray it would help to visually differentiate the product more easily. Then again, it's all about context. If I saw this in the same aisle as mouthwash I'm more likely think is was breath-related than if I saw this at the checkout (where I usually see breath fresheners). Ah sucralose, my old friend. In small doses, like in this breath spray, I'll be fine, but if you've been reading my blog for a few years you might remember that in high doses, sucralose (and other artificial sugars) cause me to experience vertigo. Back when I was reviewing a lot of those flavored zero-calorie type drinks I experienced vertigo that lasted for hours and resulted in a trip to the ER for some anti-vert meds. Fun times. This is just a few tiny puffs of breath freshener, so (hopefully) nothing will happen. 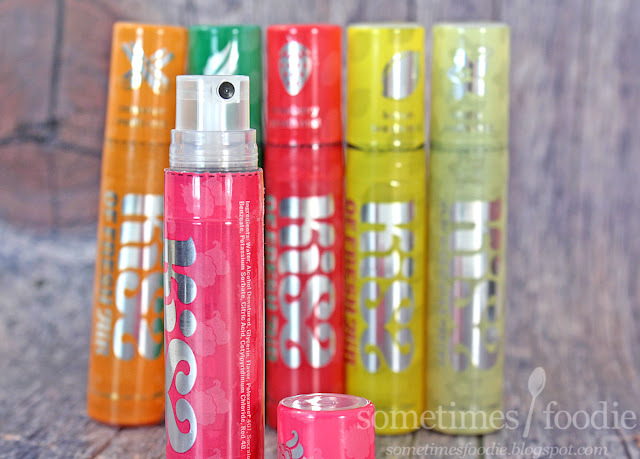 Cinnamon: This spray reminds me of Big Red gum and cinnamon Red-Hots. It's warming, due to the spiciness, but also cooling thanks to the artificial sugar and alcohol. It's pleasant, but I've never liked cinnamon toothpaste or mouth wash. Cinnamon just doesn't make me feel clean, so this flavor wasn't for me. Raspberry Whipped Cream: I was really intrigued by this one. Can something that sounds like a dessert really freshen my breath? And if so, can it really taste good? Surprisingly, I liked this one a lot! 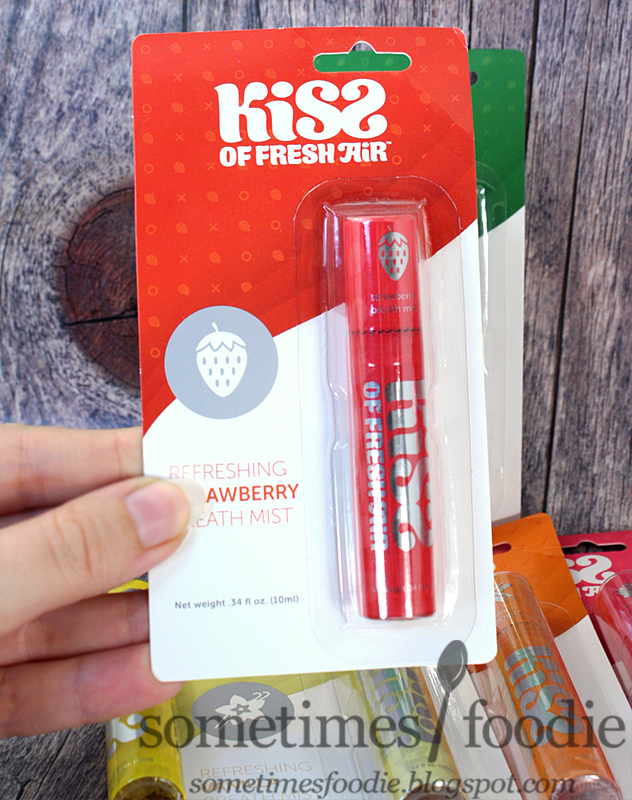 It's sweet, fruity, and vanilla'd, but it has that alcohol-infused mentholated effect that all breath sprays have, and even with all those sweet and candy-like flavors, it really did freshen my breath. I was shocked I liked this one so much! Peppermint: Nothing to report here. 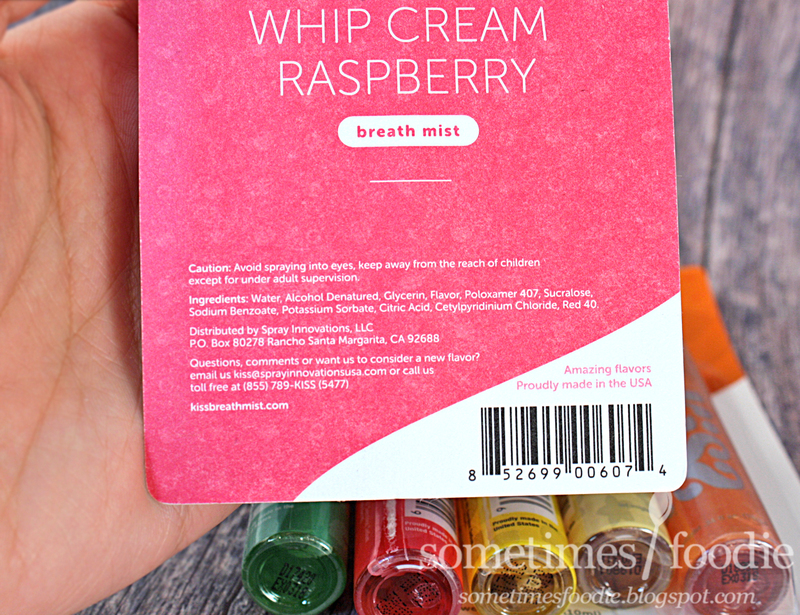 This spray is sweet and peppermint-y. A breath freshening classic, and it does it's job well. It's a good purse or glovebox staple, but it's boring when you compare it to the wackier flavors. Strawberry: Nope. I did not enjoy this one. It has a strong medical mentholated flavoring, with a hint of fruit. It reminds me of cold medicine, those strawberry hard candies in the foil wrapping you get at your grandma's, and Ricola throat drops. I had high hopes for this spray, since the raspberry and whipped cream flavor was so great, but this one fell flat for me. Lemon: When you spray it into your mouth, it tastes just like those bottled zero calorie lemon-flavored waters, and even with the slightly tingly mentholated effect, it's oddly refreshing. Honestly, this seems like it would make a great pocket palette cleanser. As you can see this one was out of it's package in all the photos, and that's because I've been keeping it in my car to freshen my breath after eating out for a few weeks, and it's been working great! Plus, lemon is a less obvious way to freshen breath. With mint or cinnamon everyone knows you're trying to cover things up, lemon is more subtle and unexpected. I dig it! Vanilla: This one is more minty than vanilla-y. It tastes like a mellow peppermint candy cane, but it's really pleasant. It's distinctly different from the classic peppermint, so I think it's earned a spot in this line-up. Of the 6 flavors, only two of them were "flops" for me. (The cinnamon and strawberry.) If I had to pick a favorite...I find myself gravitating towards the whip cream and raspberry, or the lemon, more than anything else. Which is surprising. Neither of those are "traditional" breath freshening flavors, but that's what I like about them. They freshened my breath, and their flavors/scents didn't make it obvious that I had used a breath freshener, or that I was trying to cover anything up.